girugamesh is a Japanese metal band. The group started when childhood friends Shu (bass) and Nii (guitar) met up again after a number of years. Searching Chiba prefecture for band members in 2004, the two found skilled songwriter Яyo (drums) and Satoshi (vocals) to form the current group. On the live scene, girugamesh generated considerable buzz with their powerful live shows, adept musicality of a level uncommon in newly-formed bands, and their tremendous potential. The band delivered their debut album, "13's reborn," in September 2006. 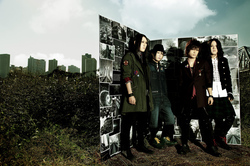 The group then released their second effort, "girugamesh," in December 2007. The band's unique and heavy sound has received a great deal of attention internationally. In fact, the group has had numerous offers to play in the United States and Europe. The group embarked on their first six-show tour of Europe in January 2008, demonstrating their ability to play in the world arena. In 2008, the group also went on a 32-show "stupid tour '08 in Japan," which concluded with a sold-out show at Shibuya's CLUB QUATTRO. In the summer, the group toured again, selling out the LIQUIDROOM. In November, the group announced their third album, entitled "MUSIC," which incorporated synthesizers and digital beats to create a melodic and danceable sound. The group followed the release with tours on an even larger scale. From November 2008 to March 2009, the group swept through all 47 prefectures in Japan, which they finished with a sold-out show at Shibuya AX. The two-disc DVD "CRAZY CRAZY CRAZY" contains high-powered footage from these performances. In April 2009, the group played in America. The following month, girugamesh returned to Europe, where they headlined ten shows in seven countries, playing before a total of 7,000 fans. In June, the band was invited to play a long-running rock festival in Sweden and Finland. Upon their return to Japan, the group went out on their "SUMMER EVOLUTION" two-day tour of Tokyo, Nagoya and Osaka. In August, playing for an audience of 20,000 at Makuhari Messe, girugamesh put together an amazing performance in the JACK IN THE BOX 2009 SUMMER show. Finally, in January 2010 they played at Shinkiba STUDIO COST and filled the venue to over 2,000 people for the first time. They sold out most of their shows at live houses for the rest of their Japan tour. In addition to their charged live performances, the group has continued to release new recordings. In 2009, in order to challenge themselves one song at a time, the group released a string of three singles. Their new ambitions were fully realized with their album "NOW," which was released in December 2009. As the title suggests, the album is packed with the very latest from girugamesh--a heavy-hitting rush of sound that leaves us begging for more. If "NOW" gave us girugamesh's present state of mind, their thoughts about the future were revealed by the single "COLOR," released in July 2010. The vocals take center stage in "COLOR" and the single has an overall "summer" feel to it. girugamesh then released "Inochinoki" on October 6, 2010 and recently released their most recent album ""GO" on January 26.